The George Albert Converse Papers and Photographs, 1861-1897 digital collection contains hundreds of documents and photographs that comprise the physical collection held by SMU's DeGolyer Library. George Albert Converse (1844-1909) was an officer in the U.S. Navy who is remembered for his contributions to naval engineering; he was a known expert on ordnance especially torpedoes. He was a pioneer in the use of electricity on men-of-war, experimentation with smokeless powder in the Navy and the development of torpedo boats. Converse was born in Norwich, Vermont, May 13, 1844, the son of Shubael and Luvia Morrill Converse. From 1858-1861, he attended Norwich University, where he obtained a B.S. degree in 1863. He was appointed midshipman November 29, 1861 and attended the United States Naval Academy, graduating first in his class in 1865. Commissioned an ensign on December 1, 1866, he advanced through the ranks to rear admiral, effective November 8, 1904. Converse married Laura Shelby on December 9, 1871, and they had four daughters. In 1865-1869 Converse was posted to the European squadron and served on two steam sloops, the Canandaigua and Frolic, before serving a brief period with the Bureau of Navigation in 1869. He was then posted to torpedo duty until 1872, when he was assigned to the staff of Rear Admiral Thorton A. Jenkins, commander of the Asiatic Fleet. From 1875 to 1878, Converse instructed at the Naval Torpedo Station, Newport, R.I., and until 1879 was an executive officer of the USS Marion. In 1883-1884 he served aboard the USS Lancaster under Rear Adm. Charles H. Baldwin. Converse then transferred to the Naval Bureau of Ordnance, returning as an instructor to the Naval Torpedo Station in 1885. Converse was an inspector of torpedo boats at Bristol, R.I., (1889-1890), Commander of the USS Enterprise (1890-1891), and assigned to the Bureau of Ordnance (1891-1892). During the Spanish American War, he commanded the USS Montgomery with Admiral William T. Sampson’s squadron off Cuba. Converse was then detailed to the Bureau of Navigation, 1899-1901. He also served on a number of naval boards during this time. From 1901-1903, Converse commanded the battleship USS Illinois. He was then transferred to the naval department, successively serving as chief of the following bureaus: equipment, ordnance, and navigation, until his retirement in 1907. Converse died in Washington, D.C. on March 29, 1909 and is buried in National Cemetery, Arlington, Virginia. The Cyclopedia of American Biography. Volume 36, page 293. Michigan: University Microfilms, 1967. "Real Admiral George A. Converse." New York Times, 30 March 1909. George Albert Converse (1844-1909) was a naval officer whose papers include correspondence, naval orders, ship specifications, contracts, reports, notebooks, newspaper and periodical clippings, pamphlets, etc. relating chiefly to the development of torpedo boats in the United States and Europe. Most of the papers cover the period 1888-1897 and were written in Newport, Rhode Island, Washington, D.C., and England. Converse is known for his contributions to naval engineering, especially the development of torpedo boats. Also included are photographs of various ships, construction of ships and other related views. 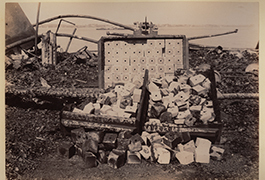 There are also views of ruins of a gun cotton factory after an explosion, "Cushing's" experiments with torpedoes, Yarrow & Co. torpedo boats, and steam yachts. Some photographs are by Frank H. Child and some by Child & Co. The digital collection contains most of the items within the physical collection. For more information on how the physical collection is arranged, please view the finding aid. The George Albert Converse collection came in as one unit with manuscripts and photographs. The manuscripts, clippings and pamphlets in Series 1 relate to Converse's naval career and work in experiments with torpedo boats. 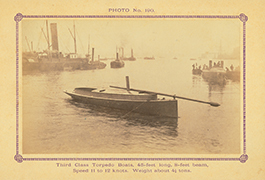 Series 2 consists of photographs of various torpedo boats and their construction and miscellaneous printed material. 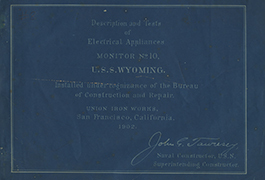 This series consists of Naval orders, Navy correspondence, letters, reports, and pamphlets related to ships and torpedoes, blueprints and periodicals from Converse’s Naval career. Official Naval Orders for Converse 1861-1884. Official Naval Orders for Converse 1885-1897. 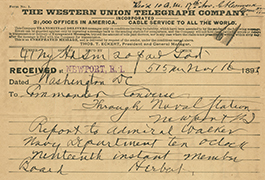 Correspondence with Inspector’s Office, 1897, including a 21-page letter from Converse to Assistant Secretary of the Navy Theodore Roosevelt reporting on the Torpedo Boat Porter. Correspondence and memoranda regarding the boilers on the Torpedo Boat Cushing. 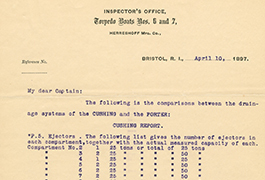 Correspondence about the Torpedo Boat Porter. "Torpedo Boat Engines" by J.A. Normand. 31 Knots for the Twin Screw Torpedo Boat "Forban". Built at Harve [sic] by Mr. M. A. Normand, ca. 1895. 1st Class Torpedo Boat "SOKOL", Built by Yarrow & Co., for Russia. Report, Contract and Specifications, 1894. Torpedo-catcher, an 8 page document that includes specifications for a torpedo-catcher, also known as a destroyer. Sea-going Torpedo Boat constructed at ''La Seyne'' for the Russian Government. Engine Power, 512 I. HP, a 36 page report on a sea-going torpedo boat constructed at La Seyne for the Russian Government . Schichau: Description of a Torpedo Boat I Class, 1886, a 16 page document that includes the description and specifications of a torpedo boat I class. The Torpedo Station, ca. 1882, a pamphlet describing the history and functions of the Naval Torpedo Station on Goat Island in Newport Harbor. Navy (Torpedo Boats). Return to an Order of the Honourable The House of Commons, August 4, 1887, a pamphlet containing the response of the Admiralty of the Royal Navy to a House of Commons inquiry regarding tests of the Navy's torpedo boats conducted in May 1887. The Whitehead Torpedo. U.S.N., 45c/m Mark I. General Description, 1894, a book containing technical descriptions and 17 cyanotype diagrams of the Whitehead Torpedo and its components. The information was prepared at the Naval Torpedo Station on Goat Island in Newport Harbor (Rhode Island) by order of the Bureau of Ordnance and approved for use in the Navy. The Whitehead Torpedo. U.S.N., 45c/m. Marks I and II. Notes on Care and Handling, Disassembling and Assembling, etc., 1895, a book containing instructions for the care, handling, disassembling, assembling, manipulating, and adjusting of the Mark I and Mark II Whitehead Torpedoes and their accessories, as well as a list of names and reference numbers of parts. Collisions at Sea. A Letter by John Donaldson, M. Inst. C.E., M.I.N.A., etc., 1882, a reprint of the letter written by John Donaldson to the editor of The Times of London and originally published on April 15, 1882. 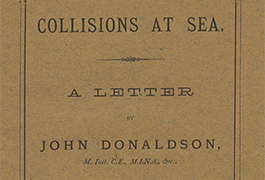 Donaldson, a marine engineer and partner in the shipbuilding firm John I. Thornycroft & Co., decries the loss of life that typically resulted from ship collisions of the day and recommends several key changes to the structure and fittings characteristic of ships at that time, including the fitting of all merchant ships with an overhanging bow. Some Experiments to Test the Resistance of a First-Class Torpedo-Boat, 1883, a leaflet containing the text of a paper read by Sir Alfred F. Yarrow on March 15, 1883, at the 24th session of the Institution of Naval Architects. Description of the Electrical Launch Built Last Year, 1884, a pamphlet containing the text of a paper read by Sir Alfred F. Yarrow on April 2, 1884, at the 25th session of the Institution of Naval Architects. The paper describes an electric launch built by the Electric Storage Company, the Siemens Brothers, and Yarrow Shipbuilding Limited. In addition, the results of various trials undertaken with the launch are reported. Torpedo-Director for Broadside Pivoted Tubes, 1894, a 3-page document explaining broadside pivoted tubes and giving directions for their use at the Torpedo Station in Newport, Rhode Island. Torpedo-Boat Destroyers [...] Statement of Mr. John Platt before the Committee on Naval Affairs, United States Senate, 1897, a 6-page document discussing torpedo boat destroyers at a hearing before the Committee on Naval Affairs in the United States Senate. [Lectures, Specifications, and Notes], a 69-page notebook containing lectures on ships as well as specifications and notes. [Lectures and Notes], ca. 1870s, by George Converse, a 9-page notebook containing lectures on ships and notes. [Torpedo boat, USS Cushing, experiments with torpedoes] , 8 photographs showing the Cushing torpedo boat experiments. Ruins of Gun Cotton Factory, July 3, 1893, 12 photographs appended to the July 14, 1893 report submitted by George Converse et al. 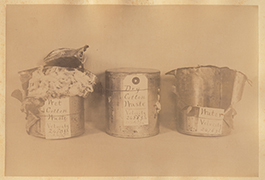 Experiments with Small Arms, July 25, 1894, showing the results of experiments with small arms fire on cans of wet cotton waste, dry cotton waste and water at various velocities. Torpedo Boats for Argentina and German Governments, ca. 1880s. Steam Yachts and Torpedo Boats, some for English Government, ca. 1870s-1880s. Photographs of torpedo boats built for the English, Austrian, Italian, and Argentine governments, for the Baroness de Rothschild, and for service on the Neva River, ca. 1870s-1880s. [Plan for a torpedo boat by F. Schichau, Machinen und Locomotiv Fabrik], ca. 1878-1885. General arrangement of 1st Class Torpedo Boat for the Imperial German Government, blueprint, ca. 1887.